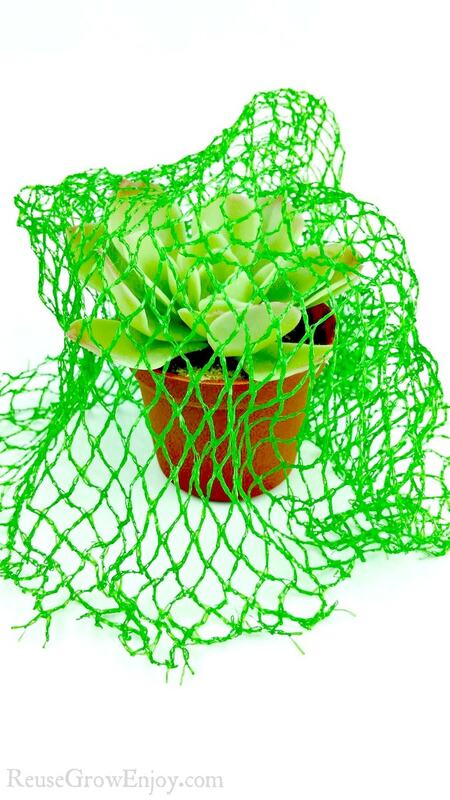 Did you know there are many ways you can reuse mesh produce bags? While the options are endless, I am going to share 13 different ideas with you. Finding different ways to recycle and reuse items that normally get trashes can be a challenge sometimes. That is when it is helpful to see ideas from others as we do not all think the same. 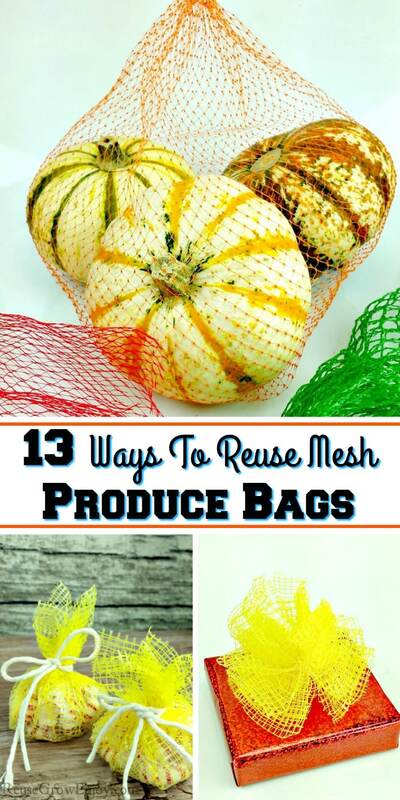 So I thought I would share these thirteen different ways to reuse mesh produce bags. This one is kind of a no-brainer. 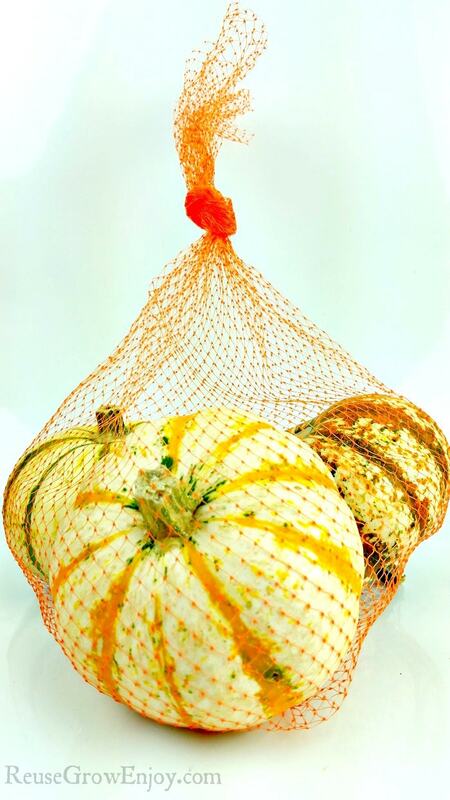 But if you shop loose produce or even farmers markets, you can reuse the mesh produce bags to hold those items. No need to spend extra money on reusable produce bags. You can use mesh produce bags to dress up gifts. 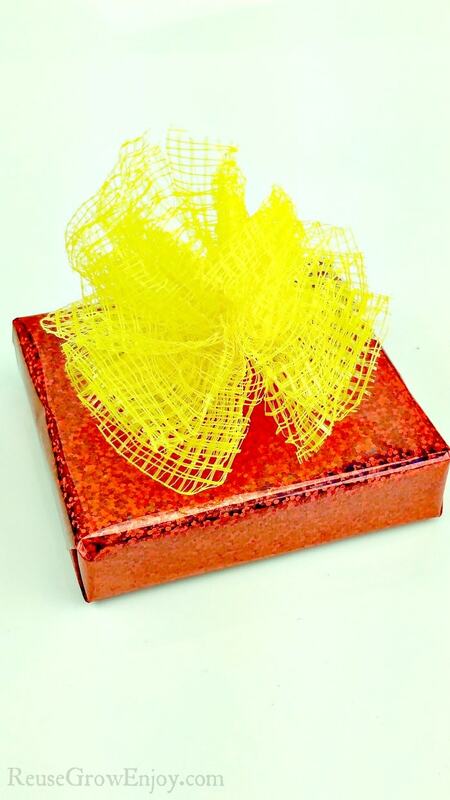 Either wrap the gift in the mesh after you have wrapped it or use it just as an embellishment. You can also gather a little together and tie it in the center to form a bow/flower to put on the top of the gift. If you like to make flower arrangments, the mesh can help hold the flowers in place so they don’t all bunch up together. Simply take a mason jar, put a piece of mesh over the top and then screw the ring on over top of it. Then you can use some scissors to trim off any of the mesh that sticks out. Having a bag to carry small toys or just for collecting shells at the beach is always a must! When you use mesh produce bags to make one, it will allow all the sand to fall out and still keep your items inside. Take a mesh bag, put it around an embroidery hoop and then place the other ring overtop and tighten it down. You want to make sure it is nice and snug so it does not slip out. Then you can loop a piece of string, nylon or whatever you have on hand on each side to make a handle to carry it by. You can either make a hand-tied scrub pad or sew one if you sew. To make a hand tied one, just fold the mesh over several times. Then in the center, use a piece of string to tie it tightly in the middle to hold it all together. To sew one, fold it over several times until you have a flat rectangle. Then using the sewing machine, stitch all the way around the outer edges. Grab a few of those little suction cups and attach them to the side of the tub or wall. Then hook of the mesh bags on the hooks. Now you can keep all those little bath toys organized and they can dry out at the same time. Making a jewelry holder is so easy to do with mesh bags. You can either use an old picture frame or an embroidery hoop. If using a hoop, just put some mesh between the hoops and tighten it down. Then hang it on the wall and hang earrings from it. If you are using an old frame, flip the frame over and remove any backing and glass from the frame. Then tightly staple the mesh to the back of the frame. Flip it back over and hang it on the wall. Then just hang your earrings from the mesh. Have some plants the birds like to pick at before you can get to them? Maybe a few small strawberry plants? You can use the mesh to cover them like bird netting. If you have a larger area to cover, save the bags up and then cut them to make sheets. Then you can use a sewing machine or hand stitch them together to make one large cover. If you like that farmstyle look, I am sure you have seen small decorative balls. You can make these using mesh produce bags! No, they will not look exactly the same, but still pretty cute. Grab a small round balloon and blow it up to about the size you want. Then coat the mesh in white school glue and wrap it around the balloon. You may need to wrap it a few times to get the look you want. Then coat it with a little more glue. Use a little coconut oil on the rim of a jar then sit the wrapped balloon on top of the greased jar until it is fully dry. After it is dry, take a stick pin and pop the balloon and slowly worth the ballon out of the mesh. Ever need to put a screen over some food to keep the flies off? Or even just for the look? Make one from mesh bags. Grab a bowl large enough to cover things like a cake, but not so big that the mesh will not cover it. Flip the bowl over and take a little coconut oil to cover the bottom of the bowl. Next, dip the mesh in some school glue or Mod Podge and then cover it over the bowl. Allow it to fully dry then remove it from the bowl. After you have it removed, you can add a knob to the top center to lift it up by. 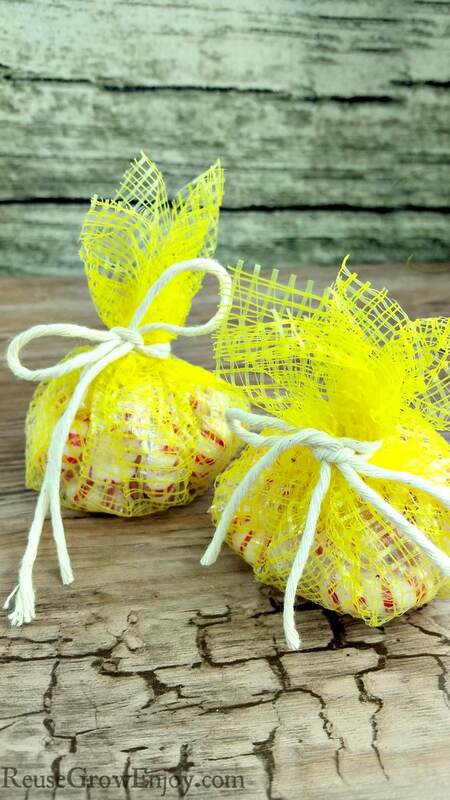 Just like you would use some fabric or tulle, you can use mesh produce bags to make little treat bags. These are great when you are having little kids parties or any kind of party really and you want to hand out little party favors. Simply cut the mesh into about a four-inch by four-inch square (smaller if you want smaller bags) and then put a small handful of candy, nuts or treats in the center. Gather the mesh all together and tie it around the top to hold it closed. Just like you made the treat bags, you can also make sachets to hold potpourri. These are nice to put into gifts or around the house or even in the drawer with your clothes to make them smell nice. Cut the mesh into about a four-inch by four-inch square (smaller if you want smaller sachets) and then put a small handful of potpourri in the center. Gather the mesh all together and tie it around the top to hold it closed. Depending on the size potpourri you use, you may need to double up the mesh so things do not fall out. Ever seen those nautical looking vases and jars? 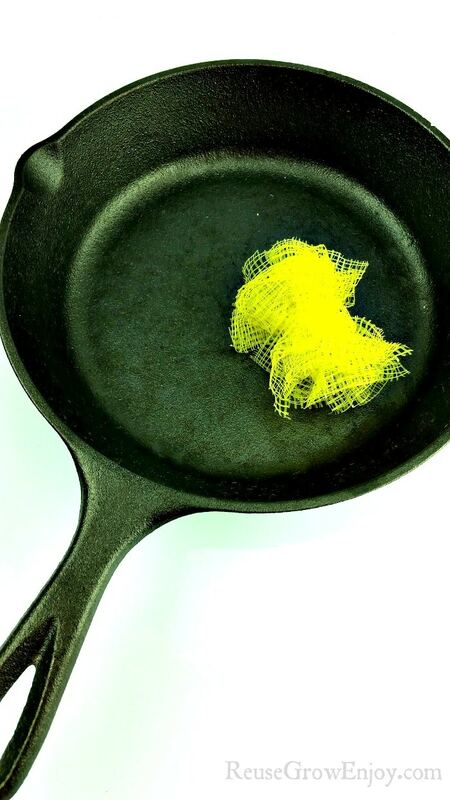 Make your own with mesh produce bags. Simply slide a piece of the mesh over the jar or vase and then wrap some string or twine around the top to hold it in place. Get creative! You can wrap it in a few places or even glue on a few things like shells, feathers or whatever you want. 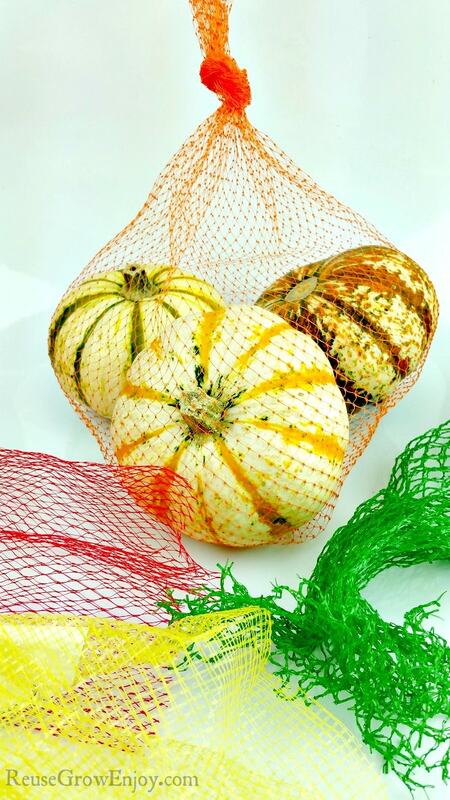 That is just a few ways that you can reuse mesh produce bags! Do you have a way you like to reuse them that I did not cover here? I would love to hear it. Looking for other items to reuse? I love these ideas. I was thinking these bags would work for drying herbs. Allows you to hang them which allows for more air flow and keeps them from sitting and getting slimy. I’m going to try it. I have never used them for drying herbs. It may work for the larger leafy herbs.